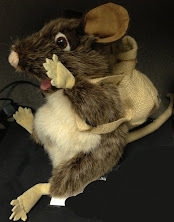 Kentucky Packrat: It Burns! It Burns! My skin does, at least. Our neighbor is in the horse-racing industry, and he obtained tickets to the Churchill Downs day at Six Flags Kentucky Kingdom for his family and ours. We were able to keep the kids lathered in sunscreen, but Milady and I couldn't keep ourselves lathered up. We're both toasty red in several spots. I'm also starting to hurt. Number One Son took a friend with him, and both of them wanted to go into the 5 foot section of Kentucky Kingdom's big wave pool. They couldn't stand up themselves, so I had to hold them up on the high waves. Considering that each of them weights over 130 pounds (and neither is overweight), I hurt today. A lot. What's worse, Number One Son is turning into a daredevil. He talked his friend and I into riding The Tornado. You get on a raft, then slide for a moment before going straight down a couple of stories into this big funnel. You then go up a couple of stories on the other side, and start down again. Number 1 Son wanted to go again, and also insisted on riding everything that even remotely resembled a roller coaster. He only rode the smaller ones this time, since no one else would go on the scarier one with him.